Protecting your home from water doesn't end with gutters. In the northeast, ice and snow are very real concerns. Team Vinyl and Roofing Co. of Hinsdale, New Hampshire, installs ice and snow protection to keep melted ice from damaging your home. Many of our roofing options also shed snow easily, providing even more protection. Just as leaf protection prolongs the life of your gutters by preventing leaf and debris buildup, snow & ice protection safeguards your gutter investment against buildup of snow and ice. Snow and ice are much heavier than people realize and can do considerable damage if left unchecked. Don't let your gutter investment come crashing to the ground under the weight of snow and ice. We protect your home and gutters from leaves, snow, and ice using the latest methods and products available. We're so much more than roofs, Shingle Roofing, and gutters - we offer all kinds of protective solutions, as well. We are experts in the field of rain gutter leaf protection. 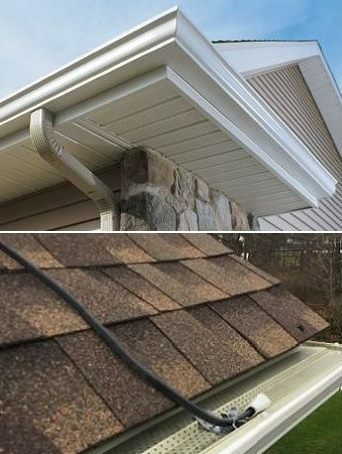 Say goodbye to clogged gutters due to leaves, ice, and snow. Leaf Relief(tm) is the leading gutter protection system on the market, keeps gutters clean year-round. Simple to install without disturbing roof shingles, Leaf Relief fits most gutters and is backed by a 25-year "no-clog, no-overflow" warranty. Make an informed choice based on the installer's record. Team Vinyl and Roofing has an A+ rating with the Better Business Bureau and we are proud to have served out local communities since 1985 with a perfect, "no complaints" record with the Bureau. Additionally, we guarantee proper function, durability, and aesthetic quality with our five-year workmanship warranty and a 20-year warranty on materials.